The idea of having a DVD, might have been wearing out, but, many of us still have a library of physical media of movies we love. We all seek ways to enjoy these old DVDs disc on our mobile devices, media streamers and we even seek a way to archive them, after all, spending on a digital copy of same movies may not be the best use of our money. Although, there is a plethora of DVD ripping software, but, most of them are not easy to use or fail to reproduce the quality of the original media. We did our research and stumbled upon Digiarty’s WinX DVD Ripper Platinum, a Windows based DVD ripping software. It is capable of ripping any old DVDs/ISO images to new movie files for better playback. Also, it converts DVDs to Apple Android, Microsoft, Sony, and enables you to copy DVD library to Plex Media Server, NAS drive, etc. Note: Some DVDs are locked with DRM encryptions, but WinX DVD Ripper can perfectly unlock those DRM, and enables us to freely rip DVDs to new movie files. Even the newly released DVDs can be supported methodically. Awesome, isn't it? You can read WinX DVD Ripper Platinum Review and Rating in our earlier post. The Hardware acceleration is divided into three levels based on video transcoding. 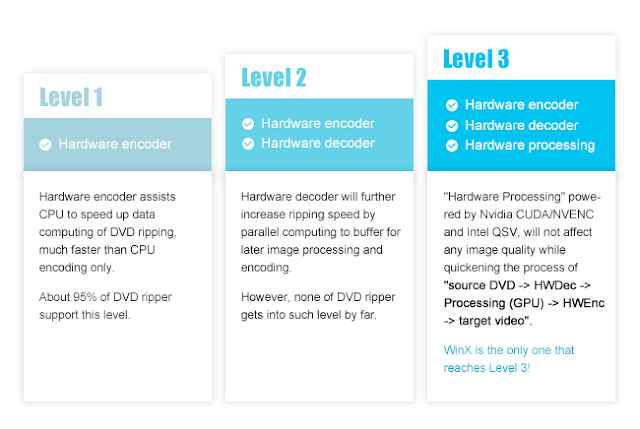 The three levels are Level -1 Hardware Encoder, Level – 2 Hardware decoder + Hardware Encoder, Level - 3 Hardware Decoder + Hardware Process + Hardware Encoder, where each of these levels delivers different transcoding speed. As mentioned earlier, WinX DVD Ripper uses Level – 3 Hardware Acceleration, this encompasses decoding, processing and encoding. This process is very crucial in video processing especially in cases when video needs to be modified in terms of aspect ratio, rotation of videos, adding subtitles, adjusting bit-rate, etc. In the absence of this technological feature in video conversion tools the CPU usage can increase steeply to 100% leading to a software crash and computer freezes. With the use of Level – 3 hardware acceleration, WinX DVD ripper unburdens the CPU from complicated computing tasks by dedicating them to GPU. Digiatry’s tests concluded that with Level-3 hardware acceleration it took 8.45 minutes with an average of 385 FPS to rip a 2.5 hour DVD to MP4 which otherwise will take 16.29 minutes at an average of 201FPS. How to Convert Old DVD Disc DVD to New Movie File for free? To win a license, participate in WinX DVD Ripper Platinum 6-month code giveaway hosted on its website. 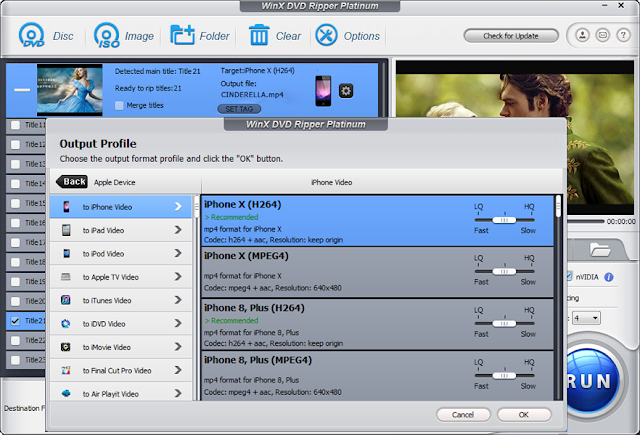 Below is a quick guide for understanding, how to rip a DVD using WinX DVD Ripper Platinum to MP4 format, while preserving the sound and picture quality. Locate the DVD Disc icon on the Home page, click on it and select the disc that needs to be converted to MP4. Clicking ‘OK’ will load the DVD content. Also, the ISO image and DVD folder can be ripped to MP4. After the source/DVD disc have been loaded, a list will pop-up where all DVD tiles can be seen. In this screen under ‘Output Profile Category > General Category’ section locate the MP4 video and click ‘Ok’. Additionally, other output formats can be selected from available categories. At the output staging area, as shown in the below screenshot, browse the folder where you wish to save the converted MP4. Once the source, target type and target location is selected, click on the ‘Run’ button to start the conversion process. This process can take upto 5 minutes to convert a full length movie to MP4 format using Intel/NVIDIA cards. In the earlier WinX DVD Ripper review and rating, we marked five starts. Absolutely, well versed with level-3 Hardware Acceleration related to DVD ripping while keeping the quality intact, WinX DVD ripper is amongst the fastest in the market which supports all types of old DVD Disc and new released DVDs. And also boasts of being the only DVD ripper that supports 3-level hardware acceleration. This tool can be the ultimate solution guide for your effective and fast DVD ripping/editing requirements. Try out the tool and let us know in the comments down below how you put it to use.